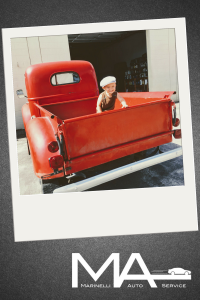 “Awe, look at that little mechanic in the making!” is a comment that Andrew and I regularly hear from people when our son is in tow. In an effort to be polite, our response is often something like, “Well, we’ll see.” We realize people are just making “daddy’s little boy” conversation, however, it’s actually a challenging issue for us. The whole reason behind opening our own shop is rooted in the fact that it’s a really difficult industry to work in and a challenging industry to adhere to quality standards. Andrew saw an opportunity to be his own boss, to create a better automotive repair environment for anyone we might employ and anyone we might have the opportunity to serve. This roots back to why Andrew even got into the industry in the first place. He had never done much more on a vehicle than change oil and put on a spare tire, so it wasn’t that he started dabbling in auto repair as a hobby, then decided to pursue it as a career. It was more that he really likes helping people in practical ways and he saw an opportunity to learn something that would be a practical service to others. So, after years in the industry where he experienced many challenges and then went to work for himself, the honeymoon period of the excitement of solving a problem on a car and fixing it has worn off. Sure, there is satisfaction in a job well done, especially when there is a grateful customer involved, but it’s a dirty and often unforgiving job that doesn’t pay well. While he may not put on a big smile and say, “Oh yay! I have a challenging problem to deal with today!,”I can tell you that he certainly finds fulfillment in knowing that he’s been able t provide a practical service for people who need it. If someone were to ask if we are going to encourage our son into the field, Andrew would quickly tell you “no.” We won’t prevent him from becoming a mechanic if he decides he’s being called into the field, but we aren’t going to point him in that direction. That’s what it really comes down to, is that we want our son to feel free to explore whatever he feels called to. If it’s auto mechanics, Andrew will give him a realistic picture and opportunity to see what that would be like. If it’s teaching or engineering, or dolphin training, or studio art, we’ll help him find whatever opportunity we can to explore that field and to be successful in whatever he does. Andrew and I, like most parents, just want our child to be healthy, happy, and loved no matter what he decides to do with his life. 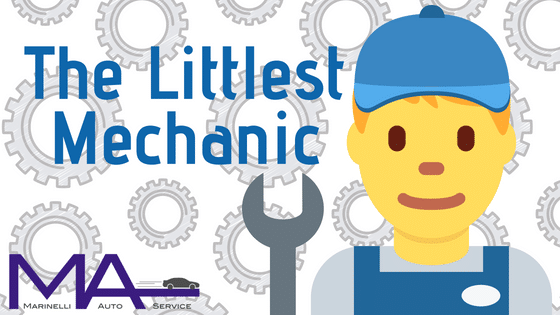 For now our “little mechanic” is doing what every one-year-old should be doing – exploring how things work in the world around him and where he fits into that world. Should that draw him into auto mechanics, only time will tell. I’m a little biased on this one because I lived near the northern part of Lake Michigan for 19 years. Although it is where I grew up, I didn’t appreciate it at the time. Now that I live in Central Florida, as I run from my car only to arrive in my house drenched in sweat from 100 degree hot humid summer, I long for the warm days and cool nights of summers on Lake Michigan. Not only is the in Northern Lower Michigan weather gorgeous in June, July, and August, the scenery is breathtaking. 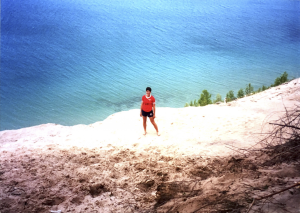 Leelanau County is a sliver of land that is home to a series of tiny lakeside towns, fields of fruit trees and vineyards, long sandy beaches, and massive golden sand dunes that you expect to only see in a picture book. Grand Traverse County has some of the best restaurants and if you time it right, you can experience the National Cherry Festival. Go a bit further north and you can take a ferry to car-less Mackinac Island and explore it in a horse-drawn carriage, horseback, or bicycle. Tour a historical fort, visit a butterfly garden, or have a romantic dinner at the Grand Hotel. Head south along the coast and you enter a string of picturesque small towns with Dutch roots. The possibilities are endless. My love of the west go back to my early teens and every time I go back, I can’t get enough of it. I’ve always flown, but would love to take a long road trip someday and hit some of our nation’s great sights along the way. My mom often reminisces of the time her father, a psychology professor, took a sabbatical and piled four young children into the car for a month long family vacation out west. I aspire to that same goal! From exploring the Rocky Mountains in Estes Park, Colorado, to cheering at rodeos in Wyoming, and horseback trail rides in Montana, I can’t get enough of it. Whether you are a roughing it type that likes to back-pack and pitch a tent in the wilderness or prefer to lodge in a beautiful hotel near amenities, there’s something out there for everyone. 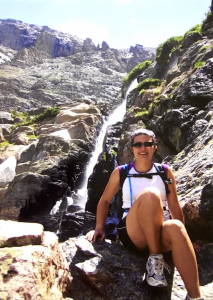 Hiking, horseback riding, and white water rafting are calling out to the physically active travelers. Or, maybe you are a more of a window shopper and sight seer and are content taking a drive through the rockies and stepping out at look-out points to snap some photos before you cruise into a mountainside town to peruse boutiques and art shops. There are so many amazing sights out west, including the Grand Canyon, Yellowstone National Park, The Great Salt Lake, Mount Rushmore, and many others. Even if you fly into Denver, Colorado, and then rent a vehicle to road-trip through the great expanse of the west, you won’t regret it. I’ve always wanted to explore more of the East Coast. A visit to Baltimore and Washington D.C. tickled my interest a few years ago and I wanted more. I could spend days exploring the museums at our nation’s capital. 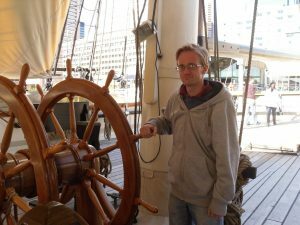 Touring old ships in Baltimore’s harbor was fascinating. I’d love to experience more of what our founding fathers started in Boston, visit some of the old battlegrounds and memorials, and then escape to Maine’s seaside for a breath of fresh air and take in some historic lighthouses. If you like history, you won’t be disappointed at what our east coast has to offer! There is also a rich culinary tradition on the East Coast that I’ve yet to truly sink my teeth into but would love to experience. From fresh seafood to lush gardens, it’s definitely something I’d spend my time exploring. 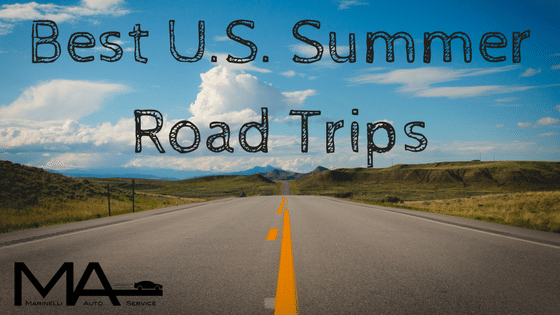 If you’ve already made summer plans to road trip, I’d love to hear where you are going. If not, I strongly suggest you make plans this summer or start saving and planning to do it in the future, to make time to explore what the United States has to offer one Interstate at a time. On May 31st, all of the tenants in our building received notice, to no fault of our own, that we must move out by July 2nd. We had no warning that this was coming and we are doing everything we can to maintain our quality standards of communication, service, and workmanship while we make plans to relocate. It is our goal to continue serving you through this transition with as little interruption as possible. In the meantime, please don’t hesitate to contact us about maintenance and repairs you might need during this time. We have a wonderful community of fellow business people who have been a tremendous support in providing advice and connecting us to all the right people; as well as friends, family, and customers who are offering their prayer and encouragement through this difficult situation. We are working with a wonderful commercial realtor to find a new space asap. We will continue to update you as progress is made. 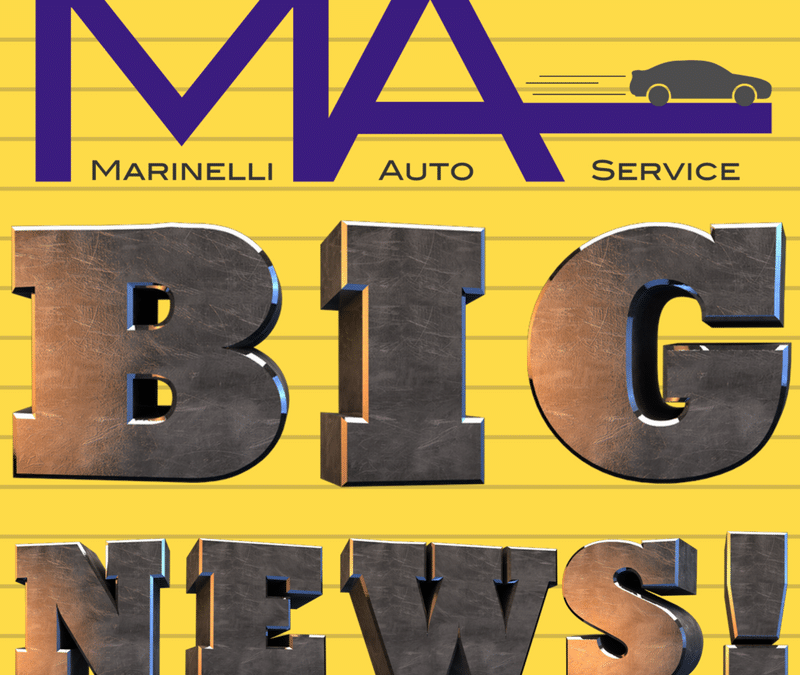 You are welcome to call (407-671-6274) or email (info@marinelliautoservice.com) with any questions or helpful ideas you might have as we make this transition. Thank you for your continued support and we will update you as this situation develops. Most of us have been there. You are at a staff meeting or a party and the boss stands up and says something to the effect of, “We’re a family,” referring to you and the however many other employees (some whom you hardly know), in a way to say you are cared for as an employee. Your mixed emotions about the job itself send a disconcerting chill up your spine. You don’t see these people as family. Sure you’ve made some good friends at this job. You celebrate your successes together and even sometimes talk about the downsides of the company, but you definitely aren’t each other’s family. It may even be that it was originally started as a family business and the CEO is the grandson of the company’s founder. However, that doesn’t make the CEO your brother. That’s how Andrew and I have often felt in previous employment. 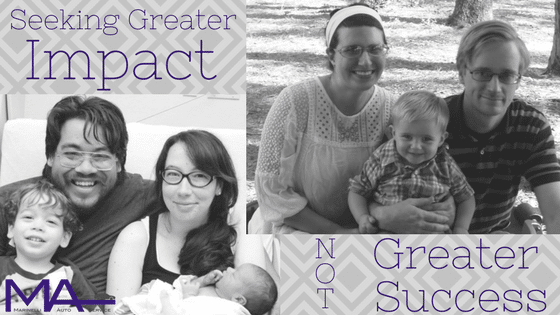 We were just trying to “get by,” pretty much since we’ve been married, not necessarily looking for a second family. He grew tired of the work-place politics that comes with working for someone else. He also saw a gap in the auto repair industry that he wanted to fill (at least for the few that would visit his shop) and decided he’d be his own boss for a change. I caught onto his vision and now we are well on our way to establishing ourselves in our community as a trusted auto repair shop. We are an actual family. We’re a family serving families. We’re small, and we plan to stay that way. We are trying to shape our business in a way that allows us a healthy family life. We’re not afraid to adjust our hours to allow for family time or to not schedule work on a Friday so Andrew can be with me while I undergo surgery. We’re a family business and if our business isn’t good for our family, we need to change our business, not our family. We need to provide for not only the practical monetary needs of our family, but the emotional and spiritual needs as well. If Daddy is never around because he’s working, then we’ve failed to truly provide for our son. It’s certainly not easy – in fact it’s been a major struggle for us – but it’s important so we keep looking for ways to make it work. The same goes for our employees. The great thing about our staff, past and present, is that we were all friends before we were co-workers. That doesn’t mean this will always be the case, but it certainly means that if we end up hiring someone we don’t know, we will make every effort to be their friend as well as their employer – we’re all on the same level just trying to provide. Our office manager, Jonathan, and his wife, Sarah, have been a part of our life long before Jonathan was hired. In fact, Sarah and I were roommates when Andrew and I got married and he moved in with us for the last couple months of our lease. When she met Jonathan, we made a point to have them over for dinner so we could get to know him better. Working together has made us all closer than ever. We help each other out with everything from childcare to bringing each other meals when someone is recovering from childbirth or illness to even cleaning each others homes. So, when we say we’re like family, it’s because we really do treat one-another like we’d treat a member of our family. If It’s a Good Business, Why Stay Small? I’ve had a lot of major health issues over the past year. One thing that frustrates me more than anything is calling a doctor’s office and having to fight to talk to the person who can address my needs. I call, choose the number on the phone menu that I think will address my need, getting a person who isn’t the right person, then being put on hold. Three people later, I’m talking once again to the first person I spoke with who asks if I can hold while I’m transferred. I don’t know these people. I don’t know the right person to talk to. When I finally do get the correct person, they can’t really address my need anyway. It’s so frustrating! That’s why I prefer small independent practices. I know who I’m going to talk to when I call, I know what to expect when I schedule my appointment, and I know who is going to be treating me. Keeping this body in good health is a challenge, I don’t want to be fighting to talk with the people helping me do it. We want all of our customers to feel like they are valued, not just because it’s good business sense, but because we really do care about people. When you call, we want the person on the other end to be familiar to you. When we ask how you are, we really want to know. We want to become familiar with you, your family, and your car. When we don’t see you for a while, we’ll wonder how you are doing. Staying small means that personal touch of being able to go above and beyond for our customers, of having a personal relationship with you and managing good quality control over our business practices and mechanical work. It means that our customers keep coming back because we’ve given them reason to trust us. It’s hard to find just the right person to fit in with any business, especially one like ours that has a very specific vision and is made up of a small team working closely together. However, we want to see our employees succeed in the ways that they are uniquely gifted. We recently had a good friend and great mechanic leave his part-time job with us to pursue a degree in electrical engineering. It was a loss for us, but we are excited to see him make an impact on his family and the world through this career change. Eventually we’ll have the resources to hire a full-time mechanic that equals his skills and ability. It will allow us to grow our business and become even better than we are now. There will come a time when we will either need to expand our business and entrust this mechanic with more responsibility or see them move on to better things. We’re not looking to expand to a multiple location business because, as I mentioned, we want to stay small. We would gladly cheer that person on to open their own business that reflects the quality of service and relationships they experienced while working for us. The world doesn’t need Marinelli Auto Services on every corner, but it does need more shops that make the effort to break the stereotype of auto repair as a dishonest industry. Our goal is not about us getting big, it’s about shaping trust within the industry. It’s not about making a name for ourselves, it’s about revealing that there’s something greater for each and every person who seeks a solution in even the most trying circumstances. Adventure loving couple, Billy and Morgan Kuehlewind, bring tons of fun into our shop. From Billy’s tactful sense of humor to Morgan’s contagious energy, we look forward to the Kuehlewind’s visits. Billy works in audio visual and Morgan works at home with baby Liam as a freelance math textbook curriculum writer. Their life looks pretty average now, but they spent the past few years working for an international non-profit organization that took them to seven different countries. Now that they are settled into a more traditional lifestyle, they enjoy visiting their extensive network of family and friends in their 2007 Hyundai Accent, the non-baby two door manual car, and their 2006 Toyota Corolla, which they dub the “baby limousine.” This is just a tiny peek into the fun this couple brings to any conversation. Our relationship with Billy and Morgan goes back further than the shop, though. Billy and Andrew were roommates when Andrew was studying to be an automotive technician and recalled a time when he went somewhere and was told to take care of something which Andrew was quickly able to advise that his car doesn’t even have! Well, the more he heard Andrew talking about how he operates as a mechanic, the more he saw that he was a guy he could trust. Both Billy and Morgan were excited for us when we opened the shop and became some of our first customers. As it turns out, the Kuehlewinds trust us so much that they have dubbed themselves “Marinelli Auto Service Evangelists” and share their testimony of their first experience with us every time they recommend us to someone. We certainly owe a lot of business to them, for which we are incredibly grateful. It all started in March 2015. They had been working with a non-profit organization that took them all over the U.S. as they raised funds and then all over the world, so they had downsized to one car – a 2007 Hyundai Accent. Their house had recently sustained flood damage, so Billy was forced to stay home from a work trip to North Carolina and Morgan went by herself. She was nearly back home when she realized something was wrong. Thankfully she was able to safely pull over and call Billy, who came to pick her up in a rental. Now they had to figure out what to do. They called Andrew, and upon his advice, they took the car to the used car dealer where it was purchased, along with a service package, hoping whatever was wrong would be covered. Knowing some of the mechanics there, Andrew told them who to ask for to work on their car. Billy reflects, “I remember [talking to Andrew about how frustrated he was with the state of the whole auto industry. People weren’t honorable and cutting corners and stuff and, I don’t necessarily think that’s unique to that industry. As it turns out, the repair would not be covered. Not only that, they suggested junking it with them for $500 but couldn’t show them any comparable vehicles for a price they could afford. So, they brought it to Andrew who diagnosed and repaired the major internal engine damage caused by the failed timing belt. The Kuehlewinds realized that they wouldn’t have been able to get a car as good as what they had for the same cost as the repair. “When he got it all done, Andrew said, ‘This car can go 100,000-200,000 more miles.’ Repairing it was a much better investment than buying a new car,” shared Morgan. The crux of their testimony comes when Billy brought the vehicle back in for routine maintenance and Andrew decided to check his previous work. After that experience, Billy and Morgan knew that they would continue bringing their cars to us. 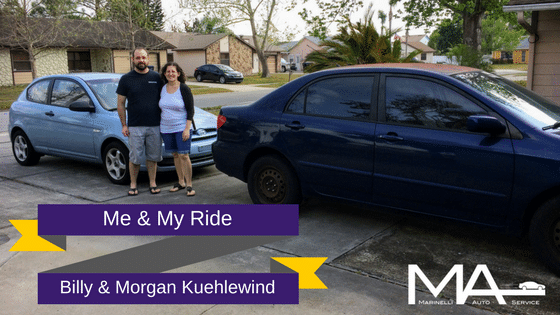 They even ended up buying a second car – the Toyota Corolla – from one of our customers because they knew the previous owner was on top of repairs and maintenance and had trusted us to help them take good care of it. Both their Accent and their Corolla have gone through our Comprehensive Inspection in order to reveal any issues their cars might have and prevent any problems like those they had with their Accent before they came to us. Billy and Morgan are certainly A+ customers, but they are also fun and genuine people. It’s because of people like them that we do what we do and feel good about the service we provide.